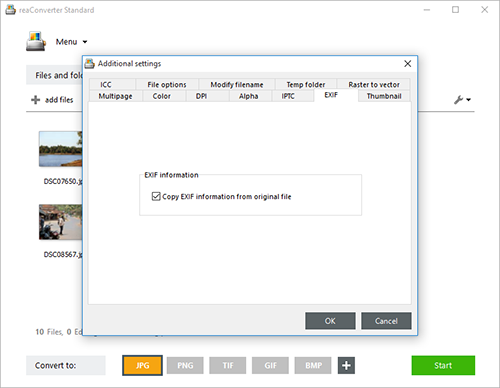 Preserving relevant metadata, such as date and time information or camera settings, can be a problem when you convert images from one format to another. reaConverter offers a simple solution for this problem. With its clear and intuitive interface, this software helps you copy EXIF or IPTC information from the input to the output images during conversion. EXIF or Exchangeable Image File Format data represents a series of characteristics related to when and how a photograph was taken, which are embedded in the image file. Such characteristics include the date and time when the photo was shot, the camera settings (aperture, shutter speed, focal length etc. ), the type of camera and the type of lens used, copyright information and many others. IPTC is another type of metadata stored according to a standard established by the International Press Telecommunications Council. While initially addressed mostly to journalists who need to attach textual information to their photographs, the IPTC storing method is now widely used by photographers to store information related to the location or the keywords that describe a certain photo. Both EXIF and IPTC metadata can be successfully transferred when you do batch conversion of image files with reaConverter. It only takes a few clicks. Load one or more images you intend to convert, by using the software's drag-and-drop tool or by adding them manually. 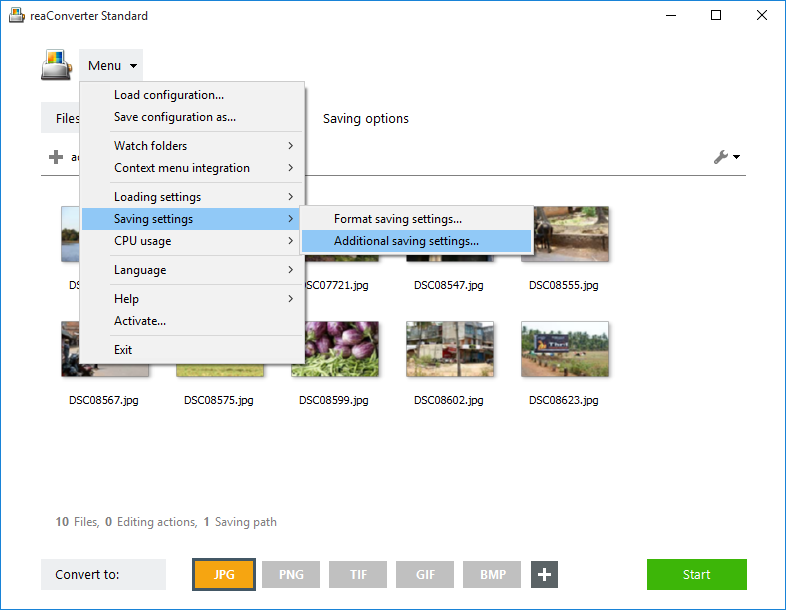 Go to Menu → Saving settings → Additional saving settings and find the EXIF and IPTC tabs. Then simply tick the relevant boxes to copy EXIF and IPTC information from the original file to the converted one. In case you want to apply any image editing features, such as rotating, resizing or watermarking, go to the Edit images tab. If not, continue with the conversion process by accessing the Saving options tab. Here you will be able to pick a local or online location for your output image files. Last but not least, decide on the new format of your images by clicking one of buttons conveniently placed in the lower part of the screen. Then simply press Start and your new image files will soon be ready!